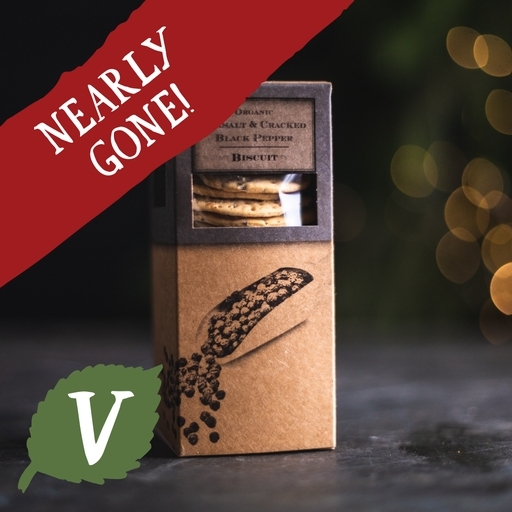 Cornish sea salt, cracked black pepper and British milled wheat come together in this simple yet satisfying biscuit from award-winning organic bakers the Authentic Bread Company. Their savoury crunch pairs well with almost every cheese, especially smooth goat’s cheese or a creamy brie. A cheeseboard sorted! White wheat flour (wheat, calcium carbonate*, iron*, niacin*, thiamin*), salted butter (milk, salt*), salt* (2%), pepper (1%), cream of tartar*, bicarbonate of soda*.